Gyeonggi Gov. Kim Moon-Soo and Hwaseong City Mayor Choi Young-Geun announce plans to develop West coastline. Gov. 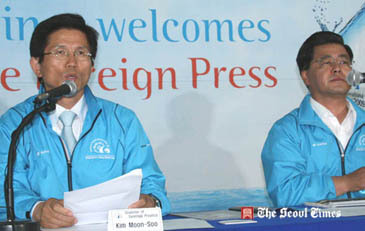 Kim Moon-Soo of Gyeonggi Province and Hwaseong City Mayor Choi Young-Geun, took the opportunity to unveil ambitious plans for the Jeongok Harbour, Seoshin-myeon in Hwaseong, Gyeonggi Province, on June 5, 2009 during the Second "Korea International Boat Show 2009." The governor invited distinguished members of the Korean and international foreign press to the event, which included a luncheon, a pleasure boat ride and a press conference to announce the proposals for the project and the general layout and design of a multi-billion won marina and industrial complex area. The Jeonguk Marine and Industrial Park is one of several plans outlined for development in The Gyeonggi Provincial Government's West Coast Development Projects. With an estimated 1, 850,000 square meters of prime development, the project will transform the small historic harbor, which dates back over 1,500 years, into a world leading centre for the marine leisure industry. 55 percent of the area will be South Korean owned, with 35 percent coming from foreign investors and 10 percent R & D investment. Port Jeongok will house a state of the art marine infrastructure with facilities to a very high international standard, making South Korea the central hub of the Asian marine leisure industry. Housing 130 berth mooring for yachts and currently in the Phase One since 2008, the intention this year is to extend the mooring to 633 yachts. The estimated cost of this extension is reported to be around 61.9 Million USD. The marina, a base for marine sports, will include a marine park, hotel, a pleasure boat pier and other aquatic marine facilities. In addition to the leisure facilities, a marine leisure industry complex, the first of its kind in Korea, will focus on the primary function of manufacture, repair and sales, distribution of the leisure boat market. This complex, located in the Jeongok area will be ready by 2010. Once established, the Marine Leisure Industry Complex and the Seongnam Marine Eco-tourist Zone will form the hub of the Northeast Asian marine leisure industry. 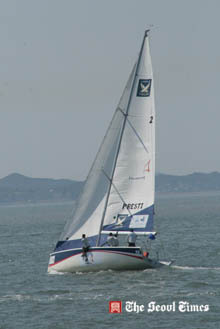 Korea Match Cup sailors race for glory. Since the establishment of the 1st Korea International Boat show in 2008, the event has been instrumental in helping to bolster and promote the growth of leisure marine activity as part of the development of tourism in the coastal region of the Hwaseong city area in the Gyeonngi Province. Due to past tensions with North Korea, much of the coastline is undeveloped, but recent economic co-operation between North and South Korea has resulted in the de-militarization of the coast offering a unique blank canvas for leisure development. Central and Provincial governments in Korea place huge importance on sustainable growth and such infrastructure developments are high on their agenda. "Two years ago, Pres. Lee Myung Bak, took the brave decision to remove rusty old barb wire fences and fortified military outposts along the West coastline," said Gyeonggi Province Governor Moon-Soo Kim. "What was originally built to keep N. Koreans out and S. Koreans in is now a beautiful piece of coast line and will soon become a world leader and the new Mecca of the marine leisure industry." He added that while other countries had taken the decision in the midst of the global economic recession to cut their boat shows this year, Korea has continued with increased participation. The London Boat Show, one of the world's four major shows, is reported to be canceling their next show, and half of the boat manufacturers in New Zealand have closed their businesses. The downturn in the industry might also be a prime opportunity for Korea to gain a foothold on the global leisure boat industry. The Middle East and East Asia have risen as the new market for the industry. The Korean market, in particular, is expected to grow to 700 billion won by 2012, thanks to the national income increase and five working days per week which resulted in increased interest on the ocean leisure. It is, therefore, safe to say that the major foreign boat manufacturers have started competitions over the Korean market where the potential demand is high. With a population of 48 million and an average wage of US$25,000 South Korea has a growing middle class with increasing amounts of disposable income. Recently government legislation has created a shorter five day working week, so Koreans now find themselves with increased leisure time at the same time as the opening up of the coastline. 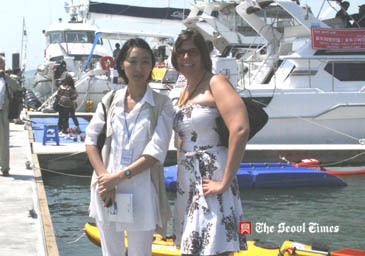 Ms. Lee Seol-Young and Ms, Jessica O'Kelly pose for camera at the Korea International Boat Show 2009 at Jeongok Harbor in Hwasong City southwest of Seoul. In its first year, the show received over 350,000 visitors, making it instantly one of the world's most highly attended boat shows (compare this to 112,000 for this year's London Boat Show or even 238,000 for Dusseldorf, Europe's biggest boat show). This is hardly surprising with a local population of over 22 million living within 50 miles of the boat show site hungry for new leisure activities with a total exhibition area of 170,000sqm (three quarters the size of Dusseldorf), in air conditioned halls, outside display areas and a temporary marina, 240 companies exhibited from over 30 countries. To inject a sporting flavor while also giving the show added news impetus, it runs in conjunction with a round of the World Match Racing Tour, held directly off the show marina. In this top international event, stars of yacht racing compete for the largest prize purse on offer in the 11 event series. All these features aim to introduce Korea's large middle class to the pleasures of leisure boating, from canoes to large yachts. With a total of KRW300,000,000 (US$240,000), in prize money, the Korea Match Cup is the richest purse on the World Match Race Tour. This year a great deal of champagne was sprayed on stage in front of the Closing Ceremony crowd, and the giant checks were presented by the Governor of Gyeonggi Province Kim Moon-Soo. This year's race finished in style with a great demonstration of light-air precision from The Quiet Italian, Paolo Cian, who lifted the top prize of KRW75,000,000 (US$60,000). Helping "Students Find Their Voices"
"A Night of The Blue Dolphins IV"
Matthew Love serves as an Associate Editor & Writer of The Seoul Times. He specializes in European film as well as other cultural and social areas. He earned his BA degree with honors in Media Production with English Literature at the University of Luton, England, and MA degree in International Cinema at the University of Bedfordshire. He is the director of Kool4katz.Tv based in Bulgaria.